Members of the National Association of REALTORS® (and Illinois REALTORS®) must fulfill NAR’s Biennial Code of Ethics Requirement by successfully completing an ethics course of not less than 2.5 hours within each designated two-year cycle. The current cycle began January 1, 2017 and ends December 31, 2018. 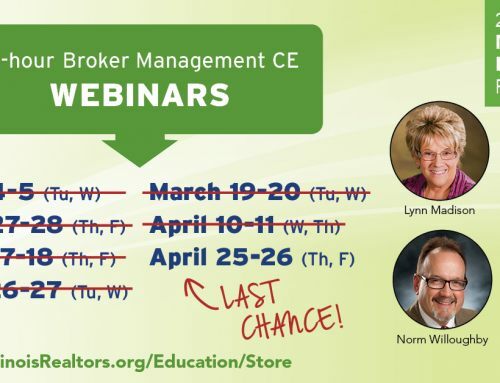 Illinois REALTORS® online CE ethics course ETH 1530 meets NAR requirements and provides 3 hours of elective CE credit. Code of Ethics: Roadmap to Best Practices is self-guided and no final exam is required. The course may be taken on any device with a strong WiFi signal. Members who have not yet met the requirement are encouraged to enroll now.